This is misstamchiak living in Ang Mo Kio. I work in Toa Payoh. I like to hang out in Orchard, Ang Mo Kio, Toa Payoh. Thai, Peranakan / Nonya are my favorite cuisines. I also love Hawker Centre, Restaurant. Owner / Graphic artist Tasneem Noor opened a Nordic cafe in 2009 when she was learning to cook Nordic food to feed her homesick husband, who is a Swedish artist. Her food is authentic homemade Swedish and you won’t find fusion here. 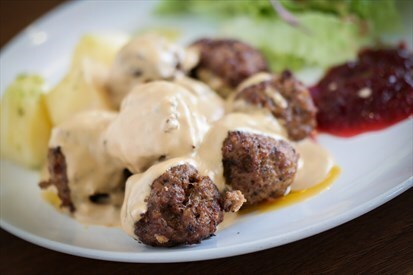 The juicy meatballs is served with potatoes and lingonberry jam, and gone in a mouthful! It’s a plate of comfort food, simple but the best! They also serve classic Swedish coffee, and Swedish imported sodas. A french inspired bistro that serves a range of dishes such as smoked duck breast ($24) with Thai coriander sauce dressing and roasted honey potatoes; lamb shank ($26), with carrots, beans, chickpeas and mashed potatoes; and chicken rendang ($14) with a choice of jasmine rice or Turkish bread served with achar. I had the Juicy Prawns Pasta ($16.90) served with juicy small prawns and garlic butter sauce. I quite enjoy their freshly brewed coffee (from $3.50) with desserts such as Royz bread pudding ($7), creme brulee ($6.50) and a selection of cakes. They are barely a few months old but is always full house during weekends. 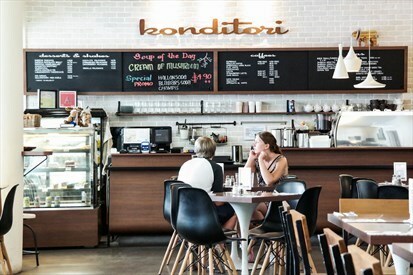 Love the feel of this rustic cafe, very laid back and intricate hangout place with friends. We tried the Bakul of Bites ($13.90) offering a platter of sweet potato fries, onion rings & orange glazed chicken wings. The Crabby Patty ($17.90) topped with mango salsa & house salad on the side was nothing fantastic. However, we quite like the Salmon Stack ($12.90) offering triple decker smoked salmon sandwich stuffed with crispy onion rings. Their house blend is roasted specially for them by Dutch Colony Coffee Roasters with a blend of Sumatran beans and Ethopian beans. Bright and smokey cuppa that leaves a strong roasty aftertaste. The guys from GRUB who have recently taken the HometeamNS-JOM Clubhouse (open to public) in Balestier by storm with the opening of FIX cafe. Built on the premise of “Original Handmade Goods”, this halal inspired cafe has put a fresh spin on traditional naan, sandwiching fresh and tasty fillings within to create a wrap they call “naanwiches”. Be sure to try their Chicken Tikka Naanwich ($11) or Beef & Kimchi Naanwich ($11). Located in a charming corner of eastern Singapore with good food and cultural heritage, Strictly Pastry is a relatively new bakery helmed by Hannah Wong who has been baking since her early teens. Here, they offer fresh pastries, chocolate fudge, meringue, sweets, treats and the smell of freshly baked pastries. Unfortunately, there is limited seating space as they do mostly takeaways. A signature here is the UGLY SUE ($3 per piece). It is ugly outside but beautiful inside. The crumbly soft meringue is filled with passionfruit mousse, rolled with fresh strawberries, raspberries and blueberries.